Boracay has the perfect conditions for kitesurfing. Wind, weather, crystal clear shallow water and some of the most beautiful beaches in the world. Known as “The Pearl of the Orient Seas”, Philippines altogether consist of exactly 7 107 tropical islands and their countless beaches. Boracay island is a perfect blend of surfing vibe, beaches and an active nightlife, but with quite an easy-going overall zen. It boasts of clear turquoise waters and some of the most beautiful white soft sand in South East Asia, in fact in the world. In early 90’s it’s been renowned the best in the world for its beaches, and in 2012 it’s been announced as the world’s number 2 best beach island just after the Providenciales, the island within the Turks and Caicos Islands. It proudly has been one of the most sought out place for kitesurfing in South East Asia for well over 10 years now and, as you can imagine, an extremely popular tourist destination for even longer. But in recent years the island went through a rough patch. It just stopped coping with the influx of tourists and slowly started turning into a fishpond. In 2017 the island attracted nearly 2 million visitors, but that number obviously isn’t sustainable in the long run. The island and its waters got so extremely polluted that it became a health risk and as predicted, the island was completely shut down in 2018 for the whole 6 months. Now reopened again, refreshed, cleaned-up and with hopefully much more sufficient and better working infrastructure, Boracay again attracts holidaymakers from all over the world although a cap has now been put on the yearly numbers. Let's just keep it that way. Both windsurfing and kitesurfing season in Boracay generally starts from late October or the beginning of November and runs until about March or even April. North-east Amihan wind blows from east consistently at about 15-25 knots during this time, occasionally even reaching over 30+. The wind blows side onshore on Bulabog Beach and usually tends to be much stronger in the morning. If you pick Boracay for your next kitesurfing holidays from about November till March or early April, you’ll have some awesome riding sessions. The temperatures stay consistent between 25 to 32 degrees Celsius and it’s mostly dry with just a very few tropical showers. But due to the island’s popularity with the holiday makers, there are some extra busy periods, specially Christmas, Easter and the Chinese New Year. Winter months are surely an ideal time to escape from the unbearable winters of the northern hemisphere, but the island and its beaches can hardly cope with the crowds. Once the main season is over, Habagat monsoon wind blows for the rest of the year, starting from late May till October. This is the Boracay’s rainy season. The wind blows onshore on White Beach at this time, the opposite side of the island, but don’t bother visiting the island for kitesurfing in the Habagat season. The wind is generally not consistent enough and quite unpredictable. You’ll only have about 50/50 chance of a good wind in this season. On the positive side though, you can score some pretty cheap holiday deals at this time of the year and the island will be much more peaceful. Bulabog beach is probably the most famous of the kitespots in Boracay island. It attracts a lot of people during the peak season, so it may get pretty crowded specially around the holiday months. The waters are mostly flat with some waves out on the reef though it can get choppier mainly when the tides are high. You can leave your wetsuit at home going to Boracay. The water is nice and warm all year around, but one thing to definitely make sure you’ll pack is a good pair of aqua booties. Not only the ground is quite rocky with coral, but there are many sea hedgehogs (urchins) hanging around in the shallow water and you don’t want to mess around and step on one of these guys. Not on your first day out. Although the beach is nice and wide during the low tides and it seems like a perfect beginners spot, it is a real deal breaker during the high tide. The water raises up leaving actually no space to rig up and launch your kite. It could all get a little tricky, even dangerous specially on a beach busy day. An alternative to the Bulabog beach may be the Union Beach. Even though Union Beach is not located on Boracay Island, you may find this spot much more enjoyable since it’s not as busy as the main Boracay beaches. Union Beach is located on Panay Island, literally just next door. This fantastic stretch of white sand is “the” perfect kitespot for kitesurfing lessons and the beginners. It has a great stretch of shallow water protected by the reef, and the best part?, there may be only a few other kiters out. To get to Union Beach from Boracay, you’ve got a couple of options. You can either take the banca boat to Caticlan jetty and then take a short ride on a tricycle to the Union Beach or, the more exciting option but only if you have a bit more experience, you can do a downwinder and kite all the way from Bulabog Beach. It will take you around 20 minutes or so. This is not exactly that easy. 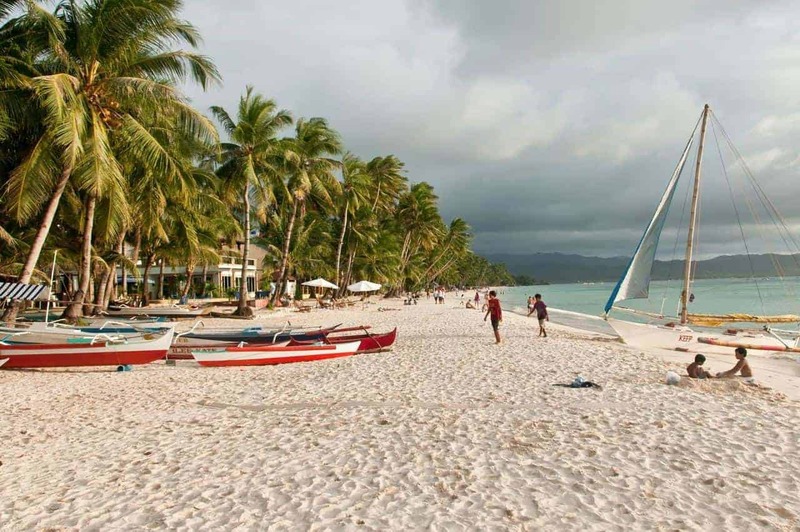 It's relatively easy to get to Boracay if you plan well in advance. I was planning a trip from Kuala Lumpur to Bulalacao in Oriental Mindoro, the very south part of the Mindoro island for Christmas & New Year's 2018. Mindoro is quite an easy reach from Boracay with a two hour ferry ride. It should be easy right? Well it turned out to be an absolute nightmare. If you leave things last minute the 'quick & easy' options will sell out. Fast. Expected. But then you're left with 'not-easy-at-all' and 'pretty-expensive' options and that's not fun. So to avoid travelling for over 15 hours and spending a lot of moneys on this trip, I ended up in Kalpitiya, Sri Lanka again. But it was good to be back! Boracay Island is about 315 km south of Manila, the Philippines capital. You can get a flight from Manila to Caticlan which is the nearest point from Boracay. Getting from Caticlan to Boracay is then only a short ride on a ferry and it will cost you around 300 PHP pesos including the environmental and tricycle fees. Or depending on your airline, you can take a trip to Kalibo airport instead and then take a minivan or a bus to Caticlan jetty. Watch out! The airlines going from Manila to Caticlan airport will only allow you to take 10kg of luggage though. You’ll have to pay excess baggage charged at 100PHP pesos per kilo if you go over 10kg. Flying to Kalibo will allow you to pre-pay your luggage with the airline to avoid excess, so just consider how heavy your gear is and what would be the best option. The Boracay Island itself is pretty small and getting around is easy on a motorbike or a tricycle. Although Boracay is the most famous for its beautiful beaches, there are also a few pretty impressive reef diving sites around the island with dozens of PADI dive centres all along the White Beach. Book yourself a dive, you’ll be quite amazed with the marine life here. Or take a kayak or a stand-up paddle session on White Beach, or just go pigging in town. There are enough restaurants to satisfy all kinds of foodies. Boracay may not be everybody’s cuppa though. As much as it is a stunning place to visit, during the peak season, the place can become a party nightmare for those who came for the serenity of the island. For over the years that Boracay has been one of the prime tourist destinations of Philippines, the locals figured out what sort of people are coming in and what they’re after, and basically adjusted the place to please the crowds. If you’re after a cultural Philippino experience, you won’t get it here, there is not much left on Boracay unfortunately. Get your kitesurfing school listed on Kiterr, now with 6 months free! Do you run a kite resort or offer accommodation in this area? Get listed on Kiterr, now with 6 months free!